A four track table top sculpture measuring 500mm in diameter and 700mm tall. 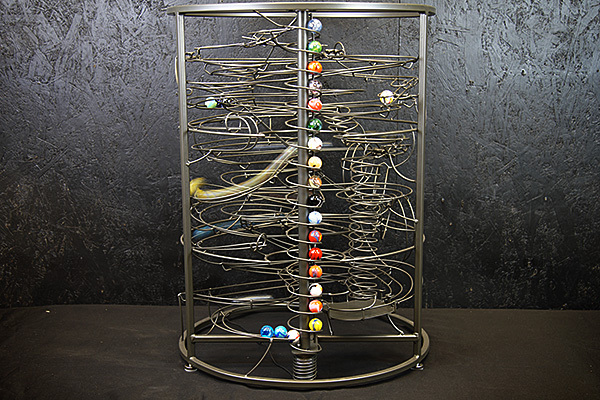 It has been powder coated in a Gunmetal Kinetic colour and uses an assortment of 25mm glass marbles. The sculpture includes tall spirals, flat spirals, multi tipping arm, balls on track, big dipper, loops and a revised version of my originally designed serpentine track. This new design is called serpentine 2.0 and features an elongated ring rather than the standard semicircle.